Are you looking for heating installation in Passaic County, NJ? At 1st Choice Plumbing, Heating & Drain Service, we offer quick and efficient residential and commercial heating installation in Passaic County, NJ. We are fully insured, licensed and bonded and offer our customers a variety of heating services. At 1st Choice Plumbing, Heating & Drain Service, we have the knowledge and skills necessary to install a wide variety of heating systems. Our services are tailored to keep you warm and comfortable throughout the even the coldest of winter months. 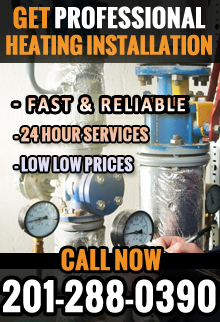 The expert knowledge and unparalleled skills of the professionals at 1st Choice Plumbing have given us the ability to provide each of our customers with advice, guidance and reliable, high-quality heating system installation in Passaic County, NJ. Once your new heating system is installed, we will remove your old heating system and will provide a post-heating installation inspection to ensure that your transition to a new heating system is smooth and easy. 1st Choice Plumbing and Heating’s staff will then ensure that you understand the full uses and capabilities of your new system. 1st Choice Plumbing, Heating & Drain Service will provide a free installation quote to ensure our services suit both your home specifications and your budget. We are available for service 24 hours a day, 7 days a week. For more information about heating installation in Passaic County, NJ, call 1st Choice Plumbing, Heating & Drain Service at 201-288-0390 today! 1st Choice Plumbing, Heating & Drain Service – Your trusted source for heating installation in Passaic County, NJ.